Hubby has offered to build a one room cabin that I will be able to use as my sewing cabin on the property of our deer camp. He's never done this before and sees this as an opportunity to test his carpentry skills. I'm not sure he knows how much work he has signed up for! This will probably happen next year...but knowing my husband I will need to plan every single detail ahead of time because he will not want to wait on me for a decision. He wants to clear the cedar trees that are slowly taking over the property and mill boards from them to make the lumber to build the sewing cabin. There's a ton of them and after walking around this weekend, there are a ton of new baby cedar trees that are coming up. Cedar trees take a lot of water out of your ground and if you can remove them, it's possible to bring back running water on your property - if it had been there before. We are hopeful since there are two dry creeks now on our property that run towards the pond in the back. 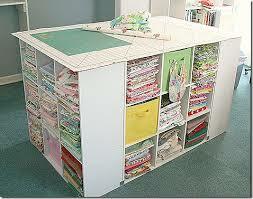 Hubby also suggested that we add a bed space in the sewing cabin for guests since our deer camp is not a large space. It's plenty of room for our family, but if another family were to come over to visit - it's cramped. But do I really want people to have access to this room when I'm not in there? It's my creative space...I don't want a block I'm designing to get moved around because my guests may have knocked it down. They may not get invited back! LOL. 1. Size! How large should I ask for? I may never get him to build another one, so I need to make sure this space will be large enough. I would like plenty of space so that I have ample room to grown in and not be packed full once I move my sewing items in. I'd like space to grow...and a coffee station. Love my coffee! I'm checking out the space at the deer camp and wondering how large our open area is. If we expand the measurements to the exterior walls of the bedroom that would be plenty of room, I think? Would 20' x 40' be large enough? 2. 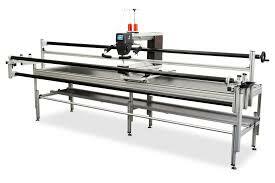 Long-Arm Quilting. I want enough space for a LAQ! I haven't even begun to research them and honestly couldn't buy one right now with all of our other committments. But one day...one day, I will buy one and I want to have the space to leave it up and not have to pack it down when I'm done. 3. Do I want to install in bathroom in the sewing cabin? Half bath? Full bath? If we are really serious about letting guests stay there, they would need their own bathroom, right? How expensive would this be to add a toilet and a sink? Perhaps a bath tub? If we really are going to use it for guests, what is the most economical way to do this? Or can I keep guests out? LOL! 4. Vintage and Extra Machines...I would love an area in this new space where I can display any vintage or additional machines I purchase in the future without taking away from my design wall space. 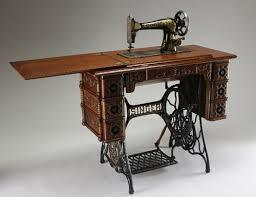 I'd love enough wall space to place a treadle machine too! 5. 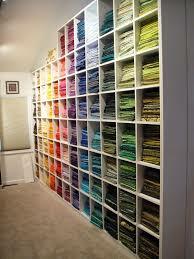 Fabric Storage. I'd love to be able to see my stash but have it not cluttered or hidden out of sight. Perhaps design cubbies around the walls with windows? Fat quarters seperate from yardage on a different wall? Integrate it into the decorating of the room/cabin? 6. Location and View! 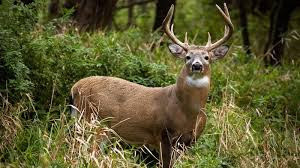 I need to find a place close to the deer camp where I can walk to easily with kids in tow yet gives me a great and inspiring view of the woods. I would love a small table area for the kids and I to sit and watch nature around us. We have been very intrigued with all of the birds and squirrels that run around us at the deer camp. We recently put up a deer feeder to watch the deer come up and feed. It's been a huge treat for us! 7. Ironing/Cutting station. Any great ideas for this space? Should I implement the fabric storage idea as in this Google photo? 8. Number of electrical outlets. Would having 3 per wall be too many? 3 units of 4 plugs per wall? 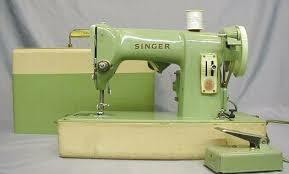 I hope I don't have to read an electrician's manual to build the sewing cabin. 9. Quilt books, etc. Should I ask for a built in bookcase too? How many books do you have in your collection? I have quite a few and they are packed away. I'd love to display them so I can actually use them when I'm creating. What would you include in building your own dream sewing/quilting space? Post your pics (of your vintage machines too!) and suggestions below! I'd love to read your ideas and comments!